Which one of these impressive devices is best for you? Good news, Apple fans (and fans of laptops in general) – there's a new MacBook Air in town, with an upgraded display, faster internals, and other improvements. So how does this shiny new device fare when it's up against Google's premium Pixelbook laptop? We're about to tell you – our comparison fits into four easily digestible sections, so you can quickly get an idea of which of these laptops might be best for you. Read on for everything you could want to know about the 2018 MacBook Air versus the Google Pixelbook. First up is the Google Pixelbook: it's a little boxy and angular, but we like the overall aesthetics of the design, and especially the two-tone finish on the back of the lid. The keyboard is lovely to both look at and type on, especially with the two rubberised palm rests at either side. Those thick display bezels aside, Google has done a great job here. When it comes to the display, the MacBook Air has a bigger 13.3-inch, 2560 x 1600 pixel screen compared with the 12.3-inch, 2400 x 1600 pixel screen on the Pixelbook. The Pixelbook, however, has a touchscreen, and can be folded over and used as a tablet if needed (albeit a rather awkwardly built and hard-to-hold tablet). Having launched in October 2017, the specs on the Google Pixelbook are looking a little dated now, though they're still very good for a Chromebook – a 7th-gen Intel Core i5 or i7 processor, 8GB or 16GB of RAM, and 128GB, 256GB or 512GB of internal storage. That's more than enough power for running Chrome OS and a few Android apps. The MacBook Air has the edge in running 8th-gen Intel chips, but you're limited to the Intel Core i5 level. For RAM you've got 8GB or 16GB to pick from, while in terms of on-board storage your choices are 128GB, 256GB, 512GB or a huge 1.5TB depending on which configuration you want to go for. All of which means the Pixelbook is slightly more powerful, even if it is using last year's Intel chips – indeed it gives you much more power than you strictly need for a Chromebook. The MacBook Air has to cope with the demands of a full operating system and its desktop apps, and should cope with most tasks perfectly well. It's not really a device for intensive video editing or gaming, but nor is the Pixelbook. The Chrome OS vs macOS question is going to be a big factor if you're choosing between these two laptops: can you get by with web apps and Android apps? Or do you need the full power of a desktop operating system? Chromebooks tend not to slow down over time, and are really simple to update, but they don't have the versatility of a MacBook. Then there's the actual hardware design too – the Pixelbook has a touchscreen and can be folded over into several different configurations. You can use the Pixelbook Pen with it, even if you can't actually detach the screen. The MacBook Air, on the other hand, is a more conventional laptop, which may or may not be what you're looking for. The Pixelbook has both two USB-C ports and a headphone jack, whereas the MacBook makes do with two Thunderbolt 3 ports with USB-C compatibility. The MacBook Air just edges in terms of battery life, meanwhile, though both these laptops should be able to stretch to the double-digit hours between battery charges, just about. Both these laptops start at a similar price point, but they're very different propositions – one a lightweight, web-based laptop that can convert into a tablet at a push, the other a more conventional laptop that gives you everything macOS offers. Those differences should be enough to tell you which one is right for you. If you're going to be sticking to mostly browser-based work and like the idea of using Android apps on a bigger screen, then the Pixelbook will appeal, though you can get Chromebooks for much cheaper elsewhere (even if they are less powerful). Apple fans will of course gravitate towards the MacBook Air. 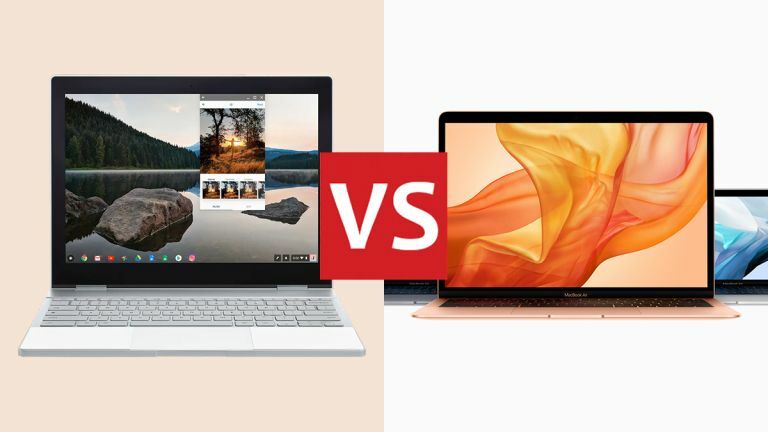 It's encouraging that there now is so much choice for the discerning laptop buyer – in terms of operating systems, apps, and form factors – and we'd say both of these devices deserve to be somewhere on your shortlist if you're shopping at the more expensive end of the market.